What an absolutely magnificent, overwhelming and ultimately satisfying film this is. 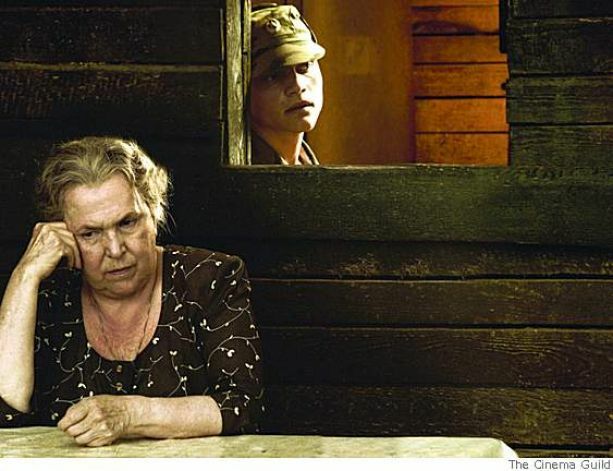 Sokurov stated he had never written his own screenplay before, but felt it his duty to write a film for Vishnevskaya, partly to honor her as a great actress, but also to hopefully expiate his sins as a young man who said nothing, did nothing while people like Vishnevskaya and Rostropovich openly decried the soviet regime and their belief in democracy and human freedom generally. Few people make more beautiful looking films than Sokurov, and "Alexandra" is no exception, despite its location and subject matter. Shot in the barren wastelands of war ravaged Chechnyan border, Sokurov's ever changing palette moves from brilliantly captured colors (a tree's leaves rustling in the breeze against a dusty background) to dreamlike darkness, black and white and sepia tone - the visual equivalent of a symphony or sonata. I always forget how frustrated I become at the beginning of one of his films because his soundscapes always begin almost inaudibly, the ear straining to catch bits of dialogue that seem almost not there. It's an effect which ultimately works drawing the viewer into the world he's creating, not unlike one's initial inability to figure out what's going on when entering a party or event. There is not much to the story: an old woman, going to visit her long absent grandson, Denis, an army captain, at his base camp on the Chechnyan border. After an arduous journey she arrives to the camp, a makeshift military tent village and settles in as images of her journey pass through her mind (this happens frequently throughout). She awakens to find Denis asleep and a truly touching reunion ensues, as he parades her through the camp watching the soldiers going about their mundane duties. 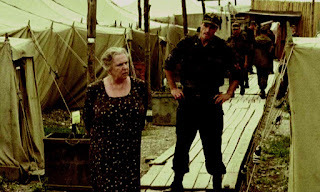 Denis is often gone, but the base soldiers stare at and interact with this independent, fiesty, rule-breaking old lady and we sense the soldiers' longing for home and love. A day long journey to a Chechen village to buy cigarettes and cookies for the soldiers, finds her in a pitiful marketplace and at the point of exhaustion, where she is befriended by another old woman, the rest of the villagers fascinated by this "foreigner." Vishnevskaya's performance is nothing short of astonishing as is her physical appearance: stripped of elegant costumes, hair color, and make up, her crusty, tired old Russian grandmother still radiates an undeniable beauty, and Sokurov's camera frequently lingers on it. That face, at once world weary, angry, frightened somehow almost always registers a kind of hope that infuses the entire film. Alexandra mumbles - constantly, even when no one's around, or her grandson has left their quarters, an almost endless monologue. Scenes of her wandering the camp, the roads, shuffling along in her old lady shoes, complaining of her bad legs is precisely the type of thing that would bore one to tears in most films, but here, oh there is something underneath all of that. Sokurov's uses his usual casting tricks and lights his actors with a radiance that everyone - even angry young men - look beatific, with a belief that everyone really IS beautiful. There is a bit of naivete in such thinking and that (for me) is what makes all of the films I've seen of his, seem "more than a movie," but never preachy. The actor portraying Denis really could be Alexandra's grandson as when they sit together on his cot, their faces are so similar it's uncanny. "Alexandra" is a war movie that never shows a single fight scene but rather the "real" price of war and in so doing, is a powerful, sometimes heartbreaking statement. The movie is almost overloaded with moments of extreme tenderness and poignancy - which against the ravaged, brutal and stark background, makes them all the more moving. 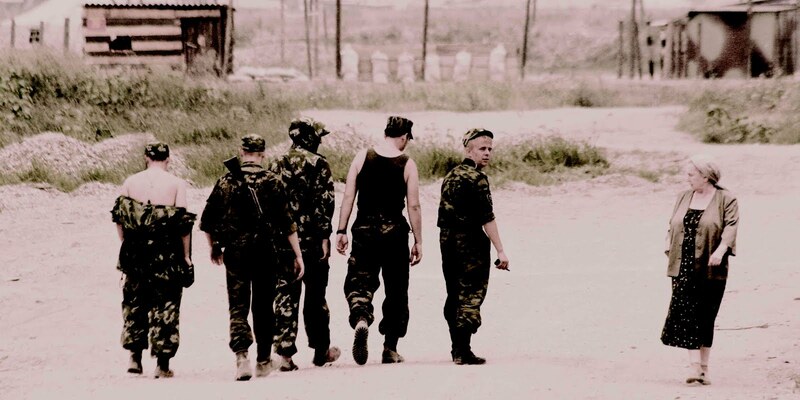 Alexandra's new Chechen friend asks a teenage neighbor boy to accompany her on the walk back to the base and their brief conversation is one of the film's most powerful moments, when he asks "why won't you let us be free?" "If only it were that simple, my boy," telling him the first thing we should ask God for is intelligence . . . strength does not lie in weapons or in our hands." The movie is filled with these little pearls that could almost be cliche, but not when uttered by this remarkable old woman. The scene of her last night with Denis almost undid me completely . . . never mind "almost" it did just that. Only 90 minutes, the movie felt even shorter and I can't recall a recent film that had me smiling and near tears so many times with so seemingly "little" to it. A truly remarkable achievement by a wonderful filmmaker and an 83 year old actress in her first non-singing film. I hope others will take the time to see this.